With house prices falling and the so-called credit crunch having an effect on borrowing many home owners are finding it difficult to sell their homes when they buy a new one. One way around this problem, at least as a temporary measure, is to rent out your old home and to use the income generated from renting to help pay for your new mortgage. How Do I Rent Out My House? The first thing to consider when renting out your home is the sort of individuals you would ideally like to live in it while you rent it out. Many people renting out their homes go for professional couples or couples who have no children or pets. This may sound perhaps like a nod towards discrimination but it is important to consider the effect the inhabitants of your home will have on it in the long term. 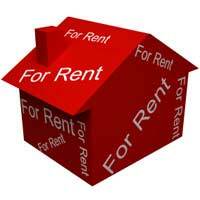 One of the best ways in which to rent out your property is to use the services of a letting agent. A letting agent can help take the hassle out of renting out your property and with experience behind them will be able to help you decide who are the best types of client to have and also what sort of rent you should reasonably expect to receive for renting a property out in your area. You should of course take into consideration that the letting agency will charge a fee for their services and this is normally taken from the rent paid every month. This fee is paid for the letting agent’s time as well as their services in dealing with your tenants and also any advertising that may need to be done. Your local Yellow Pages and indeed local newspapers will have listings of letting agents who can help you. Alas it is not as easy as it may sound being a private landlord. With the responsibility of being a private landlord comes the responsibility of making sure that the property you rent out is fit for habitation and also that all repairs are carried out in accordance with the terms and conditions of your tenancy agreement which both you and your tenants will sign. One distinct advantage of a letting agent is that he or she will draw up a tenancy agreement on your behalf and ensure that all clauses relating to repairs to the property are correctly worded and carried out. As a private landlord you are charged with the task of making sure all gas-supplied equipment such as fires, central heating and cookers are maintained to a standard and that regular checks and tests are carried out by registered Corgi plumbers. This is your responsibility and your tenancy agreement with your tenants should reflect this. As a private landlord not using a letting agent you will have to be in contact with your tenant’s at all times. By this we mean that you should reasonably expect them to contact you at any time or the day or night should there be a problem with the property such as leaking pipes, a leaking roof or other such problems which you as a landlord are liable for. With this in mind you should always try and be as courteous and professional as possible and you should try and build up some rapport with your tenants where possible. When it comes to being a private landlord you should be aware that the income from letting a house is taxable and as such you should employ the services of an accountant who will be able to keep you on the right track when it comes to taxes such as VAT, property tax and council tax. When renting out your property you should make it clear that the occupants of the house are responsible for all utility bills unless you wish to incorporate this into your rent. However it is important to note that very few landlords do this nowadays and most properties are rented out as being rent only, all other bills must be met by the landlord with the exception of council tax which you yourself must pay. For more information on being a landlord you should contact your solicitor if you have one, or make arrangements to consult with a solicitor specialising in property law, or speak to your local Citizen’s Advice Bureau. Likewise your local authority’s Housing Officer may be a source of valuable information.